Ted Yoho added to ALIPAC's illegal alien amnesty supporter list (click here) on September 4, 2015. 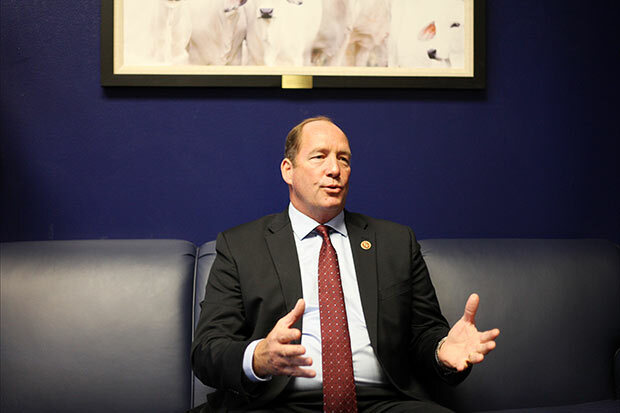 Congressman Ted Yoho (R-FL) was added to ALIPAC's illegal alien amnesty supporter list when we took a closer look at him when he announced he was running against John Boehner for Speaker along with Louie Gohmert (R-TX). While Yoho filed a bill to stop Barack Obama from funding his unconstitutional amnesty decree that actually violates many of America's existing border and immigration laws, Boehner pulled a sneaky move and changed the bill at the last minute to actually aid Obama's amnesty plans! We have to wonder if Ted Yoho was in on that deception and has been playing the role of a spoiler or foil to support the amnesty faction. When we searched for his immigration stances we found this material on the website called "On The Issues"
We are a country of immigrants. However, Washington has ignored this problem for 30 years. Illegal immigration and a broken path to citizenship threatens our national security and has created a strain on our social programs. Solution: We need to secure the border. We have not harnessed the technology, infrastructure and man power to protect our borders and we must do so immediately. I will introduce a workable guest worker program that provides immigrant workers with a national ID card and mandates they pay taxes through a national tax ID number. Finally, the process to become a citizen needs to be completely streamlined and English needs to be recognized as the official language. Q: Do you support allowing illegal immigrants, who were brought to the United States as minors, to pursue citizenship without returning to their country of origin?A: Yes. A: Yes. Washington has failed to lead on this issue. The first thing we must do is secure the borders. The technology and infrastructure exists to do so. The second thing we must do is issue an ID card for all non-US citizens presently in the US. We need to create a workable guest worker program that will allow migrant workers to go back and forth from their home countries to the United States without hassle. They would pay taxes into the general fund but not receive any benefits. Finally, we need to streamline the path to citizenship. Source: Florida Congressional Election 2012 Political Courage Test , Nov 1, 2012 Opposes exiting US to apply for citizenship. Ted Yoho's responses here indicates that he favors changing America's existing immigration laws to accommodate millions of illegal aliens that would no longer be required to leave and would be able to proceed to get licenses, in state tuition, welfare benefits, and voting rights that would allow them to eventually dominate US elections! We all remember the efforts of the Bush administration to pass this kind of amnesty in 2006 and 2007 that would create a new guest worker program that would allow illegal aliens to join, become legal, seek permanent residence, and eventual citizenship and voting rights. It is then expected the illegal aliens will vote Democrat more than 80% of the time and will be used politically to permanently destroy America's borders, immigration and border laws, gun rights, Constitution, and more. Please contact Congressman Ted Yoho and tell him you have seen the documentation that he support amnesty for illegal aliens. Remember, illegal alien amnesty supporting Republicans like Ted Yoho always deny they support amnesty because if they tell the truth they will be destroyed like Eric Cantor since the vast majority of Americans oppose their amnesty plans especially in the GOP! Last edited by ALIPAC; 01-04-2015 at 04:18 PM.